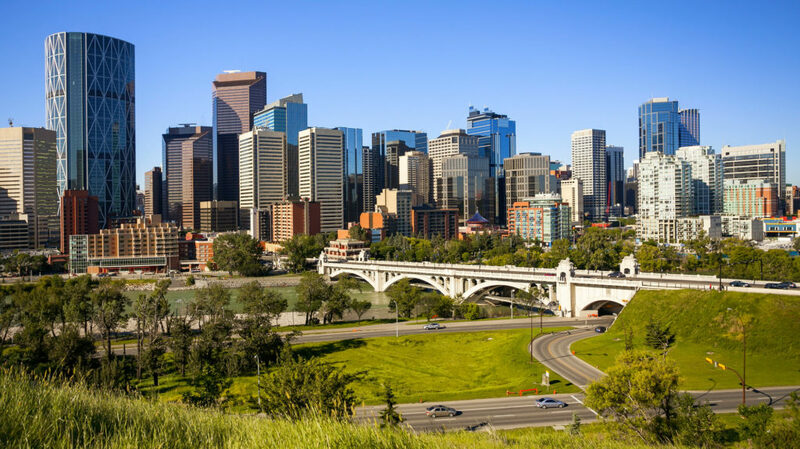 The city of Calgary offers many entertainment options for both visitors and locals. This list of 7 super cool things to do in Calgary will help inspire you. Most people who want to visit Canada only think of cities like Montreal or Quebec. Calgary isn’t exactly in the forefront of everyone’s mind. However, did you know that Calgary’s population of over 1 million is almost twice that of Quebec City? Overlooking Calgary could mean missing out on the history and culture that such a large city has to offer. Keep reading to discover 7 cool things to do in Calgary that will make for an amazing visit. The Calgary Tower is 626 feet high and was once the tallest building in the entire city. Although it doesn’t still hold its title, it provides a breathtaking view of both the city and the Rocky Mountains. Just south of downtown, near the Glenmore Reservoir, lies a 66-acre living-history village called Heritage Park. From May to September, this park is staffed by costumed employees who act out the every-day lives of Canadians during the 1860’s. Take a ride in a horse-drawn wagon and even ride a genuine steam locomotive. During those times, one of the main sources of revenue for Canada was the fur trade. During this tour, you’ll get to see the day to day functions of an actual fur trading post. Put away the phones and take a day learning about the rich history of Canada. The Stephen Avenue Walk is one of the city’s most popular shopping venues and takes up 3 blocks of 8th Avenue. Cars aren’t allowed down these blocks, and they’re home to trendy boutiques and stores, amazing restaurants, and lively nightclubs. The Glenmore Museum is known as one of Canada’s finest museums and focuses mainly on life in the wild wild west. For history buffs, they offer interactive exhibits of the First Nations tribes as well as a large collection of military memorabilia. For those who prefer art to history, the museum also has collections of Asian sculptures, European art, and African artifacts. There’s plenty to do and see, as well as plenty of interactive fun for the whole family. Prince’s Island Park is perfect for those who want a calm day in the sun. The park is family-friendly, clean, and has plenty of room for frisbee and football, as well as trails for walkers and bikers. The natural cottonwood trees make the trails especially scenic. For those looking to experience local culture, there are multiple festivals year-round as well as an outdoor theater. Right across the footbridge of the Bow River, you’ll also find the food stalls of Eau Claire Market. Calgary Stampede is a massive rodeo event that only happens once a year, but Spruce Meadows is an attraction that you and your family can enjoy all summer. Watch talented jockeys compete in racing, long-distance, and jumping. You’ll even get to tour the stables for an up-close and personal experience with the beautiful horses. The children can even enjoy the Canadian Superstore Playground and come back for seasonal events like the Christmas Market. During hockey season, the Scotiabank Saddledome is home to the National Hockey League’s Calgary Flames. They became a symbol of pride for the Calgarians when they won the Stanley Cup in 1989. Drop by to see a game and get a taste of true Canadian culture. Now that you have your list of cool things to do in Calvary, it’s time to get that plane ticket and head on over. Living a full life is about doing what makes you happy and experiencing as much as possible along the way. Click here to learn a little more about me and why I travel, and don’t hesitate to contact me with any questions or suggestions for my next trip!